To help make using your generator much more practical, SGS Engineering stock a variety of cable reels and extension cables of various lengths, thicknesses and strengths. Our range can help you work for longer and can ensure no task – no matter how remote or logistically challenging – will be left unfinished. When you’re dealing with electrical appliances, safety is obviously paramount. Therefore, we only stock the highest quality extension leads, socket converters and cable reels from leading brands such as Fly Lead and Defender. Available in a variety of lengths, strengths and amp ranges, there should be a product in stock at a competitive price to match any need. Designed for both domestic and trade use, our Fly Lead socket converters are available in 32A-16A and 16A-13A ranges, making them perfect for those who enjoy outdoor pursuits such as camping and caravanning as well. Longer extension leads can often come in useful too, especially on construction sites where the portability of key equipment is essential. 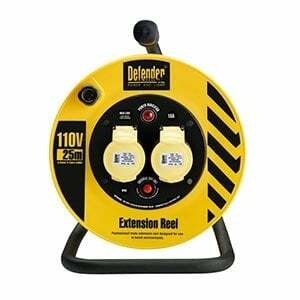 Incredibly versatile, our Defender cable reels have two sockets for extension leads and are housed in a reinforced frame, built to withstand sudden impact, which greatly enhances their durability. Finished in a bright yellow to heighten visibility, Defender products are the perfect mix of functionality and practicality. Before buying cable reels or extension cables through SGS Engineering, please browse through our entire catalogue and place an order on the accessories that best fit your requirements. Should you need more help, you can contact us via email sales@sgs-engineering.com or via phone on 01332 576 850 and our team will be available to respond to any queries regarding your order. For any unwanted goods, there is a 60 day ‘no quibble’ returns policy. All our products have a warranty policy in place too, details of which can be found on each listing or here. With such an extensive range of cable reels and extension cables for sale, picking the correct type can feel like a daunting task. However, with the aid of one of our many how-to guides, you can get all the information you may need about our entire product line before making a decision. Take a look at our ‘Generator Buying Guide’ that can help you work out which generator you need.